We look forward to helping you revitalize your health naturally! Dr. Todd Lovell has been doing just that by providing exceptional chiropractic care to patients in Alaska since 1997 when he first opened a practice in Nome. After helping patients there for many years, Dr. Todd and his wife felt they could better serve Alaskans’ health care needs by opening a second clinic in Fairbanks, Ridgeview Chiropractic, which opened in 2005. The clinic is conveniently located in the Ridgeview Business Park at the base of Chena Ridge. Our practice philosophy is based on the idea of getting you better. We’ll create a customized care schedule for you and work toward improving your overall health and quality of life for the long term. We hope that the success you’ll see with us will encourage you and your entire family to become chiropractic patients for life. Chiropractic’s philosophy is based on the idea that the power that made the body can heal any interference causing disease or pain. 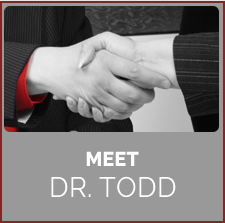 Dr. Todd will diagnose your problem and remove the underlying cause of your pain without the use of drugs. We’ll simply remove the interference that’s preventing or slowing your healing process, letting your body’s natural healing abilities take over. It’s been said that there’s a pill for every ill. The good news is we’ve seen many patients who have been able to stop taking medications to cover up their pain. Dr. Todd has also helped several individuals who used wheelchairs or walkers that have been able to walk on their own. Our patients often tell us that since starting care, they’ve felt better than they have in years! One of our patients was in a wheelchair, unable to use her legs or even feel anything below her waist. A thorough examination revealed multiple low back problems. We removed the interference to increase her joint function. Just two to three months later, she had more feeling in her legs. She went from a wheelchair to a walker, then to a cane and then finally, to walking on her own without any help. We’ll help to relieve your pain and maintain your health for a better future. Contact our office today to schedule an appointment!